President Roch Marc Christian Kaboré, has introduced some changes at the top of the military hierarchy in Burkina Faso. This was effected through decrees issued on Thursday. One of the decrees appoints Colonel Gilles Bationo, Chief of the land staff of the army, while another designates Colonel Major Oumarou Sawadogo, Commander of the Central Army Grouping. Another decree signed by President Kabore, appoints three officers of the national armed forces to the rank of deputy chiefs to the General Staff of the Armed Forces. They are Colonel Major Vinta Somé appointed Deputy Chief of Operations, Colonel Major Edmond Compaoré designated Deputy Head of Human Resources and Colonel Major Pierre Ouédraogo as Support Deputy Chief. 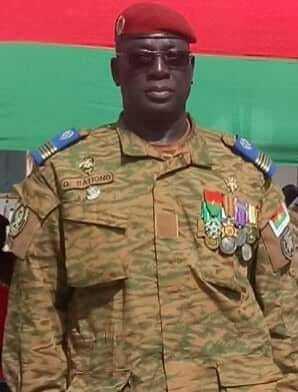 Colonel Hamidou Zongo is the Central Director of Peace Support Operations, while Commander Ahmed Roamba is appointed Central Director of Army Sports. The fourth decree appoints Colonel Karim Ouili, Director of Military Communication and Public Relations at the General Staff of the Armed Forces. The fifth concerns non-commissioned officers of the national armed forces appointed as commanders of the army’s military region. Thus, Colonel Yves Patrick Ouédraogo was appointed Commander of the 1st military region, Colonel Adam Néré, Commander of the 2nd military region and Colonel Moussa Diallo, Commander of the 3rdmilitary region. The sixth presidential decree concerns the appointment of officers to the ranks of heads of division in the General Staff of the Armed Forces. They are Colonel Pankabo Biwanlo, appointed head of Operations Division, Colonel Théophile Nikiéma appointed head of Training Division and Colonel Emmanuel Poda appointed head of Military Intelligence Division. Another decree appoints two technical advisers to the General Staff of the Armed Forces. These are Major Colonels Labawo Forogo and Claude Kaboré. These appointments come a few days after the new Chief of General Staff of the Armed Forces (CEMGA), General Moïse Miningou, appointed on January 10, 2019, assumed his role on 31 January. The appointments takes place after changes in the Ministries of Defence and Security, now headed by Moumina Chériff Sy and Ousséni Compaoré respectively.